From his first presidential campaign, we know that President Obama and his team are masters of marketing and reaching the mass audience. Now it seems as though they are pulling out some interesting tactics and using the now debunked “birther” issue to help get the Obama message across. 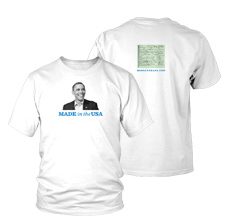 The official Obama re-election campaign is now selling T-shirts emblazoned with his face above the slogan “Made in the U.S.A.” On the back is an image of his birth certificate. The fundraising pitch says the shirt is a “limited-edition” item. What do you think about this? Is it all in good fun? Will you be buying and wearing one of these shirts? It’ll cost you a minimum of a $25 donation to the re-election campaign.